Some of the material here will be outdated very quickly. However, the principles will be distressingly relevant for quite some time. Also, this is not my primary Weblog, so it is not updated all that often. I was going to write a book about "Why Unbelievers Hate Us", but not only was I busy with my creation science ministry, but so many examples would make the book so huge, it would fill up a saddlebag and make your horse list to one side. The preaching of the cross is offensive (Gal. 5:11, 1 Cor. 1:18-20), and the unsaved people hate us (John 15:20, 1 Cor. 2:14, Matt. 5:11). Indeed, they react without conscious choices because they are under the control of the father down below (John 8:44). They don't want to hear that they are sinners in need of repentance (Luke 24:46-47), and that Christians have repented for salvation and adoption as children of the living God (Rom. 8:15-16). One problem we have is that unbelievers ridicule us to justify their own rebellion against God; being a conservative Christian who actually believes the Bible (especially creation) means, to them, that someone is stupid. Conversely, being a liberal (as well as an old-earth Christian or theistic evolutionist) who does not exactly believe what the Bible says ("moderate" Christian) and hanging around with atheists, well, that makes someone like that smart: s-m-r-t. Compromisers who get cozy with unbelievers are actually useful idiots for them, but atheists, other unbelievers, and compromisers are all useful idiots for Satan. They also laugh at us for fighting among ourselves. Some of that comes from being short-sighted and looking for an excuse to carp, since Bible-believing Christians are to silence heretics. Interestingly, someone made a comment on a Weblog that an atheopath "should be silenced". He may not have been intentionally using Titus 1:11, and an atheopath took it as a death threat — which was an amazing stretch of "logic". Paul was not calling for people to be taken out and killed in that verse. Rather, we are to effectively shut their mouths in our apologetics, where they have nothing useful to say in reply. Ironically, unbelievers and Darwinistas are actively trying to silence us. I have to interrupt myself here and point out that mockers set up no-win situations and have double standards. When we follow biblical teachings to refute false teachers, then we "can't get along with each other". If we turn a blind eye to the foolish actions of some professing Christians, then they overgeneralize and say that those people are typical of the "religious". One double standard is that they actively practice the things they accuse us of doing. We can't blame unbelievers for pointing out the way Christians treat each other and disregard verses like John 13:35. The King James Onlyists have some extreme views about their One True Bible™ — some of them even claim that if you were not led to Christ via the KJV, you are not saved! Knowledgeable Christians can refute the KJVO positions, and even show translation errors in the King James Version; no translation is perfect. KJVOs say that other Bible versions are "corrupt", a position that is reached through circular reasoning and bad scholarship. But I've digressed enough on that point. The Calvinists will act like Mormons, trying to recruit other Christians to their true, correct understanding of Scripture; if you deny the "doctrines of grace", you're unsaved or a weak, stupid Christian. (I've experienced and seen Calvinists being sanctimonious and condescending to non-Calvinists, and even lying.) Conversely, angry Arminians will slap leather with Calvinists, calling them heretics. I'd like to slap the lot of them (in love), we're to follow Jesus, preach the gospel and equip the saints, not treat each other like horse apples. Then we have owlhoots supposedly in our own camp doing stupid things, and often for profit. I used a "generator" for this. 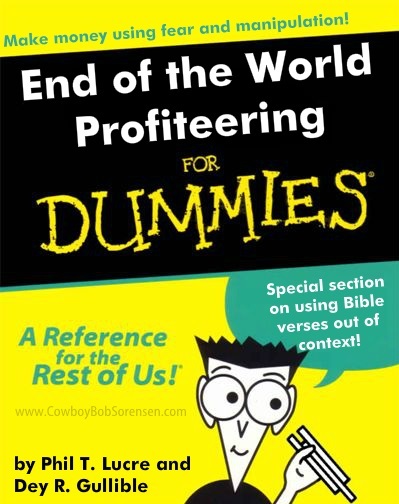 No insult intended toward the "For Dummies" books, I like most of the ones I've read. Some church I've never heard of sent me mail with a "prayer rug" (a picture on paper) with instructions to kneel on it, pray, list my needs, make a donation, read a "sealed prophesy", send it back to that church... Leave me alone. Here is Page 3 of that letter. No wonder unbelievers laugh. Jack Stahl runs the Church of Tom Jones, where he says the voice of Jones helps him get in touch with God. He used to run the Progressive Universal Life Church, which seems to be out of business now. Years ago, I bought an ordination through them under a blatantly fake name, but they didn't bat an eye and sent it. Still have the wallet card. (Later, a pastor told me that if I had been a member of his church, I would have received church discipline for that silliness. I've learned a lot since then.) Getting in touch with God through the music of Tom Jones? No wonder unbelievers laugh. There is a movement among some Christians with various names like "Quiverfull", based partly on Psalm 127:4-5 and on how people in the Bible had many children. This is not a command. I wonder, do adherents have contempt for people like me who, uh, got the cat fixed because we have decided we have enough children, or for people who cannot have them in the first place? If someone wants to have lots of kids, that's between them and God. That's it. The more time-sensitive material in this article is that the world is supposed to end. Last week, late September, 2015, or in a range from September through some period in 2016. We had the "four blood moons" thing just end, and nothing happened. There is also talk of Planet X (sometimes called Nibiru) swinging along and wrecking the planet — or ushering in the end of times. The CERN physics stuff is supposed to be dedicated to Shiva, or Lucifer, or opening portals to other dimensions (see "Dis-CERN-Ment and the End of the World"). Although Planet X and CERN fears are not exclusive to "religious" people, there are believers who are caught up in the hype. No wonder unbelievers laugh. Chris Rosebrough was hot under the clerical collar, and I was upset as well, with Jim Bakker selling disaster supplies on his show using fear of cannibalism as a manipulative tactic! The contradiction that Chris spotted was that Bakker is saying money will be worthless, so why does he want it? Obviously, it won't be worthless, and he knows it! It puts a burr under my saddle when people join up with those tinhorns by being guests on those shows to sell their merchandise. I lost a lot more respect for Carl Gallups for hawking his book on the Bakker show. Too bad, he did some good work presenting videos on PPSIMMONS refuting evolution, but now he's into sensationalism. There are professing Christians who are making filthy lucre from fear and gullibility, and some use date setting (trying to pinpoint the actual or near approximate date for the return of Jesus, ignoring Matt. 24:36-41). No wonder unbelievers laugh. Although there are religious types whose actions are making a mockery of Christianity, there are some Christians who are vigilant and actively exposing the hucksters. Our faith is in the Word of God, not in sensationalistic, Scripture-twisting con artists who say, "I have an anointing!" or promise special "new" knowledge. Atheists, evolutionists, other unbelievers mock the truth of Scripture, and we don't need to give them more reasons to do so by making a parody of ourselves. Calm down, check their claims with the Bible.